This post originally ran in 2006 on Fitfare, a now-defunct site that was part of the Well Fed Network, which also does not seem to have had much to say recently. I realized that although I have written about gazpacho twice before on this blog, I never actually posted the recipe on this site, so here is the original post, with recipe. Summer to me has become synonymous with Gazpacho. Those ripe summer flavors of tomato, cucumber and bell pepper completely epitomize what summer means to me--a dose of fresh, raw crispness in the middle of a sultry day. The origin of the word gazpacho is uncertain, but etymologists believe it might be derived from the Mozarab word caspa, meaning "residue" or "fragments," an allusion to the small pieces of bread and vegetables in a gazpacho soup. On the other hand, it may be a pre-Roman Iberian word modified by the Arabic . 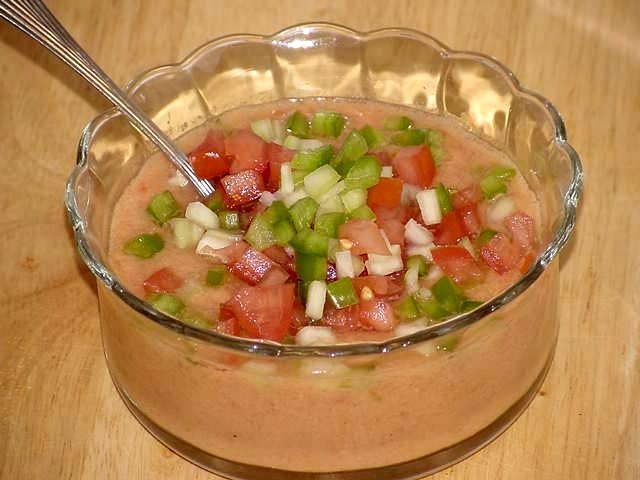 . .
José Briz, who wrote a book on gazpacho, also suggests that the word derives from the Hebrew gazaz, meaning to break into pieces, referring to the bread base. The original gazpacho was bread, water and olive oil pounded together in a large bowl out in the fields by the farm laborers, who would make it their lunch. Over the years it has developed into the tomato, cucumber and bell pepper blended soup we know today. When I was in high school my mother discovered Gazpacho and whipped some up for us in the blender. This was around the time that cooking shows like "The French Chef" and "The Galloping Gourmet" were widening our culinary horizons for the first time. It seemed like at least once a week we were hit with something new--Ratatouille, Curried Chicken, Fondue. And Gazpacho. I don't know where she got the recipe, but we were skeptical about the whole idea of cold soup. And what she served us were mugs filled with finely chopped tomatoes, cucumbers and bell peppers. I don't remember any other flavorings, and I don't remember being all that impressed with it. I was so unimpressed, as a matter of fact, that I decided I didn't care for it and never tried it again. Until a few years ago when my friend and co-worker brought me a taste from a batch she made from The Ex-Boyfriend Cookbook, by Thisbe Nissen and Erin Ergenbright. It was what I later found out a good Gazpacho is supposed to be: a perfect blend of all ingredients, with none standing out above the other. I immediately made her give me the recipe and it has become my staple summer dish. While most recipes call for some form of bread or breadcrumbs, I like the light fresh flavor of this recipe. You can use any kind of tomatoes, cucumbers or bell peppers (each adds its own particular flavor), red or white onions, and red wine or sherry vinegar. Although I should warn you, once I tried the sherry vinegar, I haven't looked back. *Having acquired my Cuisinart stick blender since writing this post, I now just throw all of the ingredients into a large jar and give it a whirl with that. Makes it much easier. Haven't made this yet this summer, but I think I will be this week. It is too damned hot. Oh, and I made two different BBQ sauces for this 4th, one using your worchestshire and the other finishing off mine. A full report to come. Yes misreall, this was the perfect thing to beat the heat this weekend! I'm stopping at the store on my way home from work today to load up on tomatoes and cucumbers! I'm interested to hear your W.S. report. Oh, and I think I'm ready to tackle the mustard whenever you're rady. Thanks, Elizabeth, andthanks for stopping by.